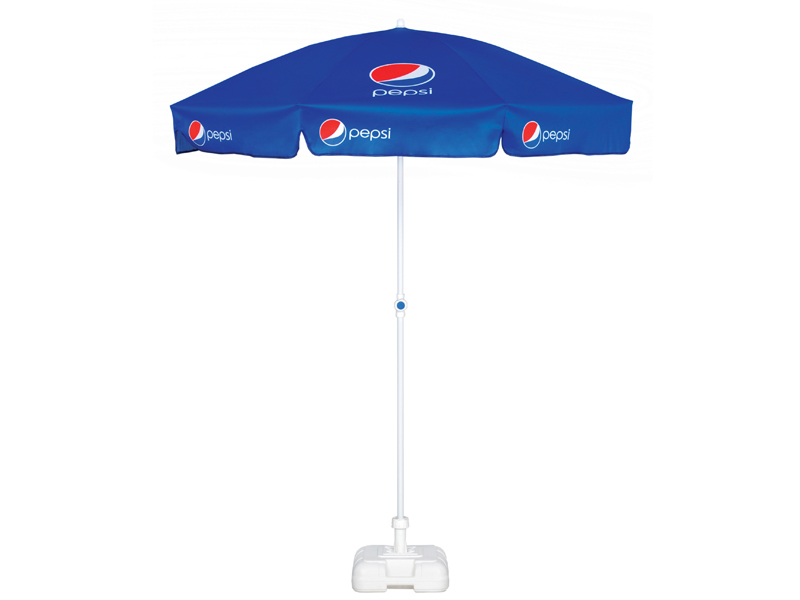 There are lots of different types of branded parasols out there so it can be baffling where to start and how to choose the best printed parasol for your business. These are your traditional old-school parasols that you typically find outside pubs and cafes. They are small (measuring 1.8m), neat and perfectly formed! A pub-style printed parasol are lightweight and easily portable, but be warned don’t expect them to withstand strong winds. These are great if your budget is tight and looking for a more ‘disposable’ option – for a one off event for example. Browse our Pub-style Branded Parasols range. You have an event or a business that needs a strong, robust and durable parasol, well these are your best bet. We offer a range of different sizes from 2.5m to up to 7m, with either round or square canopies, so whatever space you need to cover there is a parasol for you. You can opt for lightweight aluminium or sophisticated wood, both instantly give you a different look. 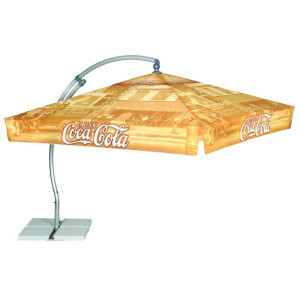 Browse our Large Branded Parasols range. These work very well for restaurants and bars as it is simple to fit multiple tables underneath – or if you have an event these give you the maximum floor space. Browse our Hanging Branded Parasols range. 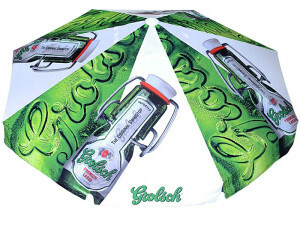 Once you have decided on what type of parasol you like you can then focus on your branding. We can design a fully branded parasol bespoke to your company, including your logo and specific artwork all for free! We have pretty much any colour canopy that you might wish for – and if we don’t have the exactly right colour we can Pantone match the colour for you*. 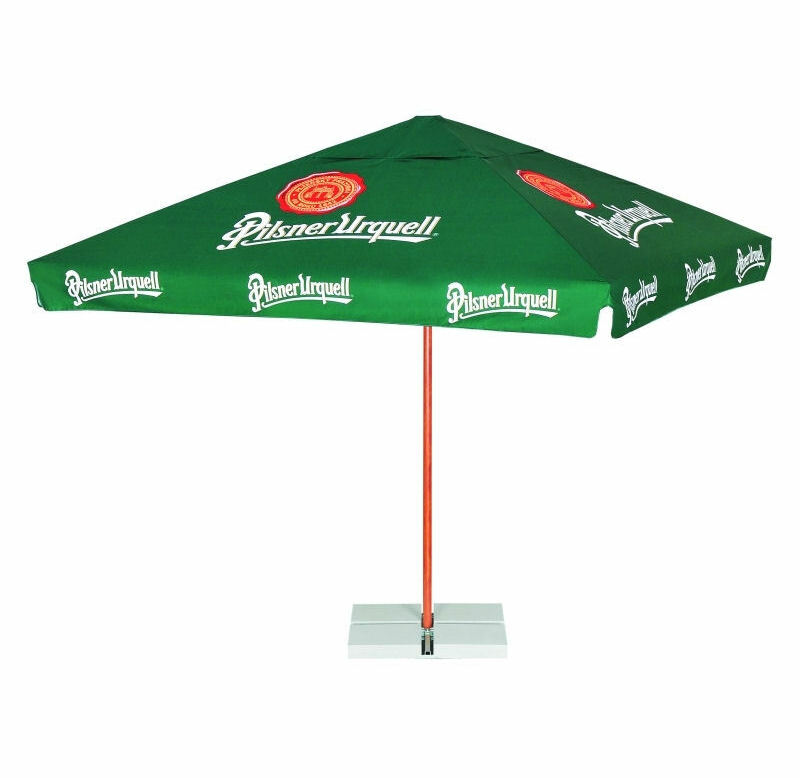 We can keep it simple and print your logo on 2, 4 or all 8 of the panels, or we can do a full print across some or all of the panels like this Heineken parasol. Let you imagination run wild and get your brand noticed! And best of all, we can supply you with just two or three parasols or hundreds. And finally if you are still stuck then why not give one our of team a call and they can help run through the options that suit your requirements.